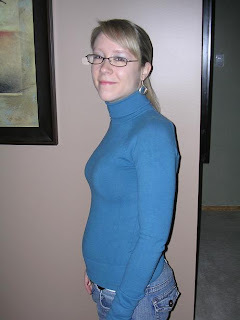 Life as a Pregnant Diabetic: WEEK 13 - FIRST VISIT TO THE OB....HEARD THE BABY'S HEARTBEAT! WEEK 13 - FIRST VISIT TO THE OB....HEARD THE BABY'S HEARTBEAT! It’s really something else to finally have that proof that there is really a baby in there!My husband and I both REALLY liked the doctor. He is a very kind and caring man, with a great sense of humour, and a willingness to give me lots of time to answer questions and put me at ease. He said that he is very comfortable with my level of diabetes control and feels that the baby will be fine if I continue with this level of control (which I still am striving to improve every day). He does expect to induce me at around 37 weeks (i.e. mid-late May), which is common for diabetics. There are two factors that play into this early induction. First, it is common for diabetics to have larger babies. This is because my bloodsugar tends to be higher than that of a non-diabetic’s, and higher than that of my baby (no matter how hard I try to keep it at reasonable levels). As such, my baby’s body produces extra insulin to make sure that it can maintain non-diabetic bloodsugar levels, even with the added sugar coming from me. This extra insulin, being a growth hormone, causes the baby to grow larger. Second, according to the doctor (and this is something I was not previously aware of), with diabetic mothers sometimes the baby's heart will suddenly stop around week 40, and clearly that is NOT something we want to have happen. So as soon as the baby is fully developed, even if he/she is not an exceptionally large baby, the doctor would like to get him/her out of there. I was hoping not to have to be induced, but obviously the biggest concern is for the safety of the baby, and if that's what the doctor thinks is best, that is what I will do. I will be having very regular appointments with the OB, as well as regular fetal assessments (i.e. a special type of ultrasound) starting around week 24 just to keep an eye on the baby and make sure his/her growth is reasonable and consistent.